These numbers are based on costs for the 2018-2019 academic year. Amounts will change slightly from year to year, but as the cost of college increases, the scholarship packages will correspondingly increase. Your official financial aid award will be included in a letter directly from Penn. Because Penn provides financial aid packages that cover 100% of your demonstrated financial need, generally Penn will need to adjust your package when outside funding is received. 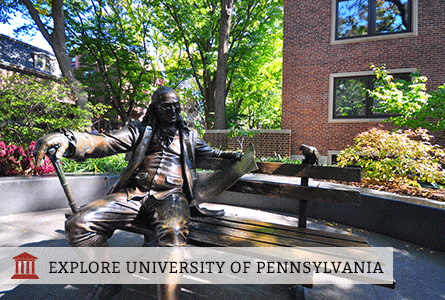 Penn considers your outside funding as part of your overall financial aid funding. First, outside scholarship funds are applied to reduce or eliminate your summer savings expectation. Next, any remaining outside funding will be applied toward your work-study award for the academic year. If your outside funding is larger than the combined value of your summer savings expectation and your work-study eligibility, the remaining amount will replace university grant funding. Outside funding cannot be used to reduce your Parent Contribution. Promptly report any funding you receive from sources outside the University. Email scholarship correspondence as an attachment to outschol@pobox.upenn.edu or if necessary, mail copies to the Outside Scholarships Office at the address below. Advise your sponsor to make checks payable to Trustees of the University of Pennsylvania, to include your name and Penn ID number in the documentation, and to mail the checks to the Outside Scholarships Office at the address below. PSIP is the Penn Student Insurance Plan. This health insurance is mandatory for all full-time students who are not covered by private insurance, or whose private insurance does not meet University insurance requirements. If you do have private insurance, be sure to submit proof to Student Health Services by their deadline, or you will be automatically enrolled in PSIP. For insurance requirements and enrollment information, visit the Student Health Services website. An allowance for travel is included in your cost of attendance. The amount is determined based on your permanent address. Students must apply for aid each and every year in order to maintain the match scholarship award. Penn is the nation's largest university with a financial aid program that enables all dependent undergraduates eligible for aid to receive grant-based aid packages for eight semesters. Financial aid awards are comprised of a work-study job and grant only; there are no loans included in a student's financial aid package. Penn makes it possible to graduate debt-free. The University covers all determined financial need for QuestBridge Scholars with a package made up exclusively of Penn grant and federal work-study. Your eligibility is determined by considering income, assets, family size, number of dependent children in college or private school and the cost of each school, all taxes paid, and special circumstances. Your student contribution includes a portion of student income from dividends and interest (if applicable), and savings from summer employment. Penn waives the summer earnings expectation for first-year and sophomore students who are Highly Aided (income less than $65,500 and Parent Contribution less than $4,500). QuestBridge Scholars will be asked to save $1,800 from summer earnings as rising juniors and rising seniors. The total cost of attendance above does not reflect the $1,800 summer earnings expectation for rising juniors and rising seniors. The University of Pennsylvania believes a diverse student body, drawn from a broad range of economic backgrounds, enhances the educational experience of all students. To this end, Penn does not consider an applicant's financial aid status or the family's degree of need in making admissions decisions, meets the full need of all admitted and enrolled students for the duration of their undergraduate career at Penn, and does not include student loans in meeting dependent students' needs. Penn has a strong commitment to awarding aid only on the basis of financial need, and awards no academic or athletic scholarships. Penn expects each student's family to contribute according to their financial circumstances; expected contributions, based on a comprehensive review of each application, range from $0 to the full cost of education. Because family situations can often change significantly from year to year, Penn re-determines a student's expected family contribution each year. For that reason, QuestBridge students will generally be considered for a four-year Match Scholarship only in those cases where the expected parent contribution is less than $500, and it appears unlikely that it will change over time. Penn is need-blind for citizens and permanent residents of the United States, Canada and Mexico, and guarantees to meet the full demonstrated need of all admitted students without loan, whether or not they are selected for a Match Scholarship. Use the University of Pennsylvania's Net Price Calculator to determine the financial aid for which you are eligible.